Sustainability for the good of our planet | Cox Automotive Inc.
Cox Automotive aims to become carbon neutral and water neutral by 2044 and achieving zero waste to landfill by 2024. At Cox Automotive, April is in the spotlight as Earth Month, commemorating the official Earth Day designated as April 22. 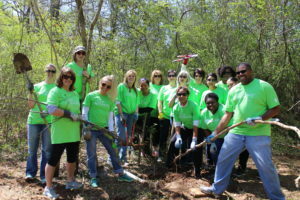 While Cox emphasizes employee learning, volunteering, and charitable giving on sustainability in April, the company’s environmental endeavors actually continue unabated year round. That’s because the corporate commitment to sustainability is not only about changing behaviors at work, but also at home, as well as recognizing dealerships that do the same. “While we have sustainability initiatives at our operating locations, we also engage our team members and our customers,” says Stephanie Valdez Streaty, Senior Director, Corporate Responsibility. Cox Automotive aims to become carbon neutral and water neutral by 2044 and achieving zero waste to landfill by 2024. To get there, Cox Automotive is reusing the water used to wash cars at auction sites, recycling vehicle tires and reusing them at the same location, installing LED lights to save thousands of dollars on utility bills—and much, much more. Last year, the company provided funding for a new drip irrigation technology in Arizona that will save millions of gallons of water in a drought prone area. Employee engagement is the heartbeat of “being green.” Team members apply to join the corporate Go Green Council on a volunteer basis. They champion company-wide initiatives, but also support efforts at their local sites and shepherd a local “green team.” Cox Automotive has partnered with organizations for employees to participate in beach cleanups in California and Florida; river cleanups in Pennsylvania and Georgia. The company also offers employees with eco-friendly cars preferred parking spaces over traditional gas-guzzlers. Cox Conserves, an internal engagement platform, makes it easy for employees to sign up for local activities and track their daily impact. Whether it’s taking the elevator, bringing a reusable water bottle, or taking public transportation, Cox Conserves has a built-in metric to show how much carbon and water are saved and how much waste is reduced. Employees can see how their small changes add up to make a big difference both individually and collectively across the enterprise. Special April Earth Month events include electronics recycling and document shredding, zero waste workshops, paint recycling, and farmers’ markets. Cox Automotive grants awards to dealerships taking the lead in the environmental space and inspiring others to get on board. Valdez Streaty lists some of the things award-winning dealerships have in common. Other customers, like Original Equipment Manufacturers (OEMs), have also prioritized sustainability. Cox Automotive is philosophically aligned with its clientele, its employees, and the planet. As Valdez Streaty points out, sustainability is a win-win for all involved. “It creates innovation, efficiency, and saves money. It’s good for the environment, it’s good for people, and good for the bottom line,” she says.